--Thank you for visiting my website. 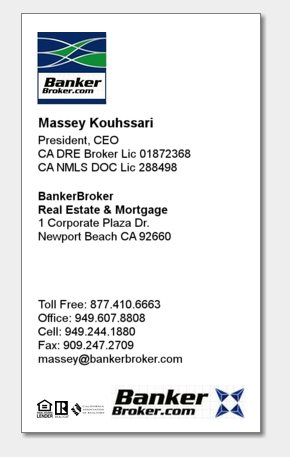 My name is Massey Kouhssari, I the broker of record at BankerBroker Real Estate & Mortgage a California firm and a proud Keller Williams Broker in Rancho Cucamonga. What sets me apart from others is my extensive knowledge of the mortgage industry, my ability to provide the most competitive interest rates at the lowest cost, along with providing exceptional personalized service – one client at a time. During my 24+ years in the business, I have had the privilege to work with hundreds of satisfied clients through online lending networks (where lenders compete for your business). This business model has been extremely successful for me over the years since I go above and beyond to make sure my clients not only get the best deal but are also 100% satisfied. Learning how to always be a step ahead of the competition while looking out for my client's best interests has been the key to my success. I have developed a reputation among realtors and clients alike for my candor, integrity, professionalism and commitment. The biggest compliment I can receive is your confidence and satisfaction to refer your family, friends, and co-workers to me when they need mortgage advice. I take pride in building long-term relationships and truly enjoy helping others. I promise to always provide an accurate upfront mortgage and closing cost quote with all fees included. Upon locking in your rate, I will guarantee the “total” closing costs in writing including all third party fees such as title, escrow, notary, and recording fee. No additional fees – No surprises – it's that simple! We have only a small credit report fee for your application, no lock-in fee and the closing costs are financed (included within your new loan amount if it's a refinance transaction). The only out of pocket expense is your appraisal fee which is typically $425. Once you lock in, I will then confirm which bank/ lender will be servicing your loan (we only represent the top wholesale banks/ lenders) and will email your loan packet along with a written lock-in/ closing cost guarantee the same day or within 24 hours. Fast approvals and convenient closings at your home are a norm. For Massey Kouhssari`s resume click here. I would enjoy the opportunity to earn your business. Please call me today for a good faith estimate (specific to your needs) at no cost or obligation.